Sunridge Community Church is a Christian church in the Temecula Valley of Southern California. Their biblically-based teaching and welcoming culture make them an ideal church for those looking to connect with God and others. Sunridge offers many programs, events, and Sunday services that give church seekers the opportunity to explore the Christian faith in a more casual environment than many churches in the area. Sunridge needed a way to connect with local residents to inform them about their programs and invite them to “join the life,” as they say at the church. They had a fairly active Facebook page, but most of the content was aimed at those who already attended the church. They needed a way to reach people looking for a church in Temecula in a way that made it obvious that all were welcome to attend the church’s special events and Sunday services. Modmacro crafted a social media campaign targeting Temecula area residents on Facebook. 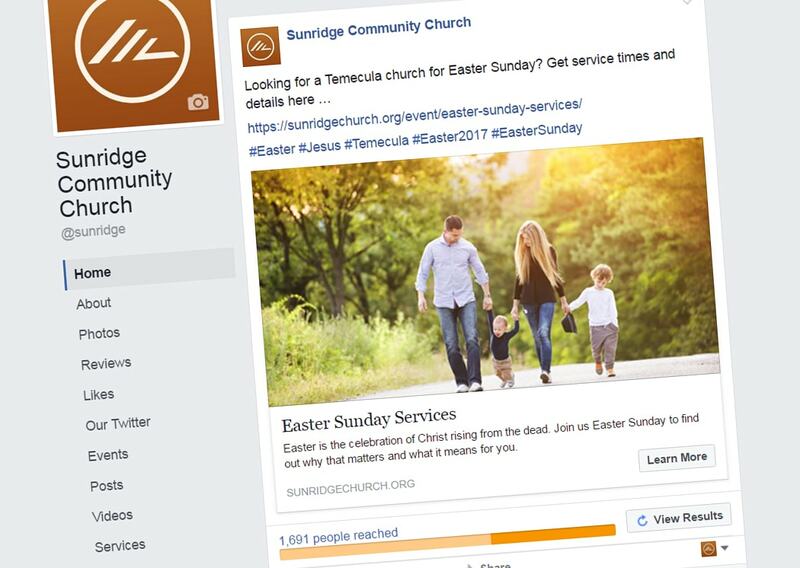 Facebook ad copy was carefully crafted so as to entice readers to click through to the church’s website for more information about the events and services being promoted, and to find out more about the Temecula church and the many ministries they provide. Through careful demographic targeting, strategic calls to action, and visually appealing ads, the Modmacro team was able to drive a substantial number of new traffic to the website. In fact, the cost per new user acquisition was optimized down to $0.14 per website visit!